Orale! Chipotles in Salsa Adobo! There’s a song that says “God Bless Texas.” That is true on soooo many levels, the least of which is that Texas is next to Mexico. Yes, but have you ever heard of “Cal-Mex,” or “Mex-izona“? Didn’t think so. But I’ll bet you a dollar to a doughnut that you have heard of Tex-Mex. Because of Tex-Mex, we’re introduced to and experience a lot of food that the rest of the country doesn’t even know exists. Fajita? Heard it first here (hell, it was invented here). Anything with heat in the spice? Good luck finding that north of the Mason-Dixon. Which brings us to chipotles. Depending upon which entomologist you believe, “chipotle” is either a Spanish-Aztec word (“chi” for “chili” and “potle,” which means “smoke”), or it’s derived from an ancient nahuatl word meaning “smoked chili.” To me, it just means tasty. This year, my sister had a bumper crop of jalapenos (along with a lot of other peppers). I, being the loving brother that I am, offered to take a few off her hands. 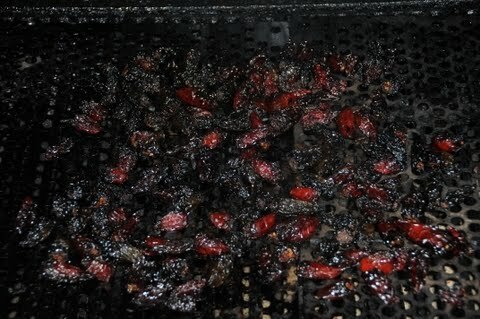 30 hours, and about five pecan logs later, and I had around 140 smoked jalapenos (also known as chipotles). “Hmmm,” I asked myself. “Whatever shall I do with these?” Stick ’em in adobo sauce, of course. Mash the garlic with the flat of your knife, mince. Peel, then puree your tomatoes. 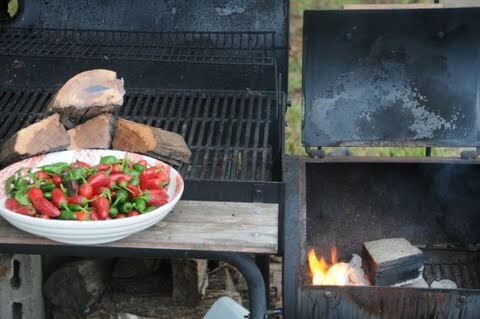 Add tomatoes, vinegar, cumin, oregano salt and 8-15 chipotles to pot (around 6 qt. capacity). Boil, then cover and simmer 1.5 hours. At this point, puree in batches. Return puree to pot, add remaining chipotles, and simmer another 1.5 hours. Salt along the way to taste. If necessary, reduce until the sauce clings to a metal spoon. When you’re done, you’re going to have around 3 quarts of chipotles and salsa adobo. 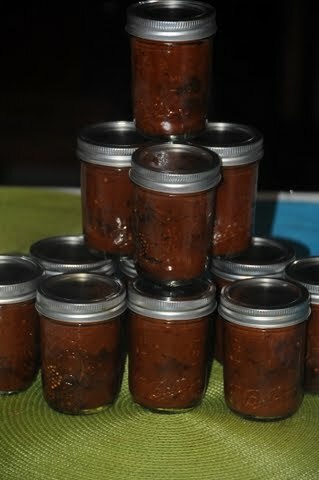 You may want to have a few 1/2 pint jars around and then can your chipotles and salsa. I filled just over 12, with each having 10 peppers (which filled 1/2 a jar).